Heather Potten is a maker of fine felt. She has been working with felt since 2008, and has contributed to textile and home exhibitions for five years. Heather holds regular workshops and undertakes commissions. 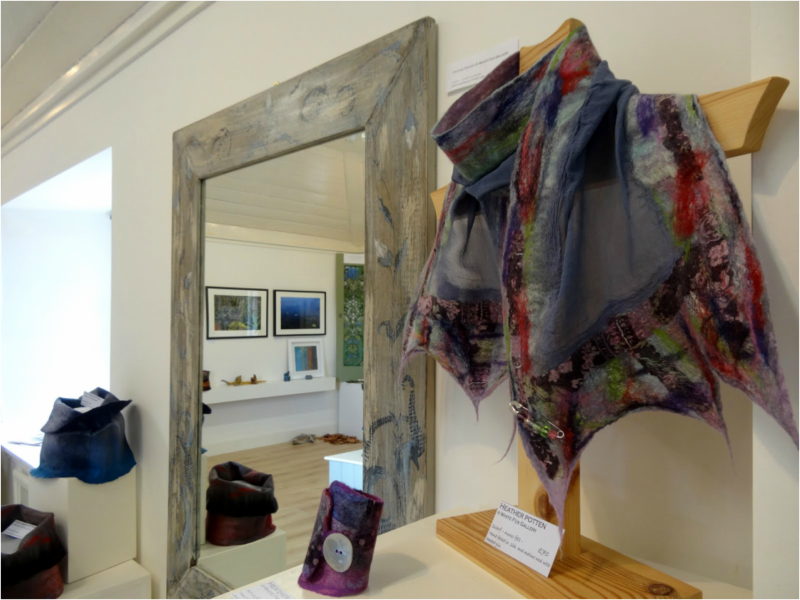 In her Edinburgh studio, she works with natural wools and silks to create art pieces and wearable accessories from hand felted material. She specialises in seamless felt and three dimensional work. Heather aims to make pieces that challenge the way people perceive felt, to show that it has strength and form, as well as beauty. Heather offers galleries, retailers, corporate events organisers and venues a range of hand made felt products for sale as well as a range of workshops and demonstrations. A trade price list is also available. Please get in touch for more information. A collection of hand made work which illustrates the beauty, simplicity and utility of felted wool. The collection comprises wearable and decorative art. All items are handmade from 100% wool and silks. The appeal to buyers is (a) visual - colour, shape and feel, (b) story – natural materials, no cutting or sewing, (c) hands on - most items can be held or tried on. Scarves - soft and colourful. Excellent shelf appeal. High quality gifts. Each one unique. Cowls and Collars - an easy-to-wear alternative to scarves. The sculptural quality of the design allows cowls hold their shape, worn high around the face or relaxed to reveal inner colours. Vases and Bowls - all about colour, texture and shape. Each has decorative detail with beads, loops or pockets. Each is a work of art. Brooches - proven saleability, new and challenging. Flower corsages are popular gifts. Seed pod brooches, 3D and embellished, are new to the market and will arouse curiosity and conversation. Heather teaches regular feltmaking workshops in Edinburgh and elsewhere. She offers a full demonstration of blending wools, using other fibres, laying out the felt, designing templates and fine finishing. She helps participants create their own designs, and encourages them to experiment with colour and texture. Find out more about Heather's range of workshops, and most importantly, what participants say about their experiences at Heather's workshops. For information on fees and charges, please get in touch. I work with natural wools and silks to create art pieces and wearable accessories from hand felted material. With different wools, I can experiment with colour and pattern, the versatility of the raw materials inspires me to explore new techniques, particularly in three dimensional work. I discover ideas for textures and shapes in the natural environment. I photograph patterns in ice, rocks and pebbles, seaweed and sand close to my home in Portobello and layer the wools organically to replicate the flowing curves and colours of nature. I am fascinated by seamless felt. I am currently developing a collection of fine felt cowls called Inside Out. Each cowl is reversible and can be worn in several ways as part of an outfit. They require a few moments to shape around the face. I design a brooch for each unique cowl. I want to show how soft and sculptural felted wool can be, as well as warm. I aim to create pieces that challenge the way people perceive felt, to show that it has great strength and form, as well as beauty. I also make felt vases and seed pod accessories. The process of moulding and shaping creates a hidden centre, which I often embellish with beads. These can only be glimpsed from certain angles, like a secret treat. Decorative details are a signature feature of my 3D work.